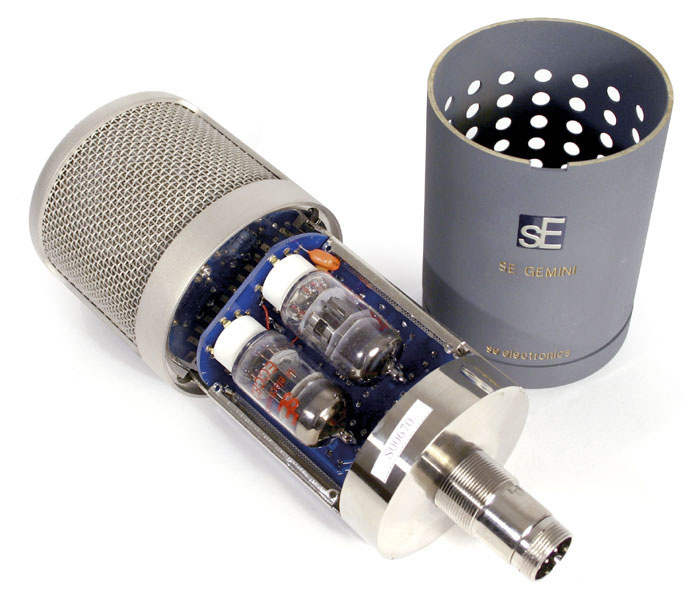 This impressive new mic from SE Electronics uses two valves instead of the usual one. But does it actually make any difference? The SE Electronics Gemini is the first of the company's redesigned large-diaphragm mics I have tested since SE Electronics set up independent design and manufacturing facilities in Shanghai last year, with a mission statement to move out of the high-volume market and to focus on more innovative designs. Given that there are so many 'me too' microphones of Chinese origin flooding the market these days, this would seem to be an astute move, and from what I've seen so far the new SE Electronics designs seem to be in a different league to most of the other Chinese-built microphones I've looked at, both in terms of design and build quality. Although this approach has taken SE away from the 'cheaper than thou' sector of the market, their microphones are still very affordable and enjoy tighter manufacturing tolerances and more extensive testing than is typical in this market sector. They also employ Japanese-made Panasonic electronic components to reduce noise and improve reliability. The Gemini represents the top of the current SE range and is nothing if not distinctive, both inside and out. This is a big microphone by any standards, and if you dug one up in your garden, you'd probably evacuate the street and call in the MOD to blow it up! It weighs well over 1kg (the limit of my kitchen scales!) and even the included shockmount weighs more than many microphones, at 480g. Dismantling the 80mm x 230mm microphone reveals the reason for both its size and its weight. At the heart of the Gemini is a 1.07-inch, centre-terminated cardioid capsule mounted inside a generously large, dual-layer mesh basket. This features a gold-sputtered mylar diaphragm and is mounted on a shock-absorbing support. However, what makes this mic very different is that it features a pair of dual-triode tubes (ECC83s) in a transformerless design. The CAD VX2 mic is the only other dual-tube mic I know of, and it costs significantly more than the Gemini. Photo: Mike CameronWhen I visited the SE factory last year, the Gemini microphone was still in the design stage, and I understood that the transformerless balanced output would be based on bipolar transistors, but having looked inside this production model I can see no active devices at all, other than the two tubes, and there's no transformer. The twin tubes are mounted in porcelain bases, and the extremely substantial machined brass body sleeve has ventilation holes to allow the heat to escape. I thought the output transistors might have been hidden inside the power-supply box, but I couldn't find any there either, so either they've hidden them where I can't find them or they've found some way to do without them altogether. One possibility is that one of the tubes has been configured as a dual cathode follower (or similar) to provide a relatively low output impedance without loading the preceding stage — that would certainly explain the need for two dual-triode tubes. At the bottom of the mic is a massively machined base housing the military-grade, locking eight-pin connector for the cable feeding the power supply unit, and once the sleeve has been fitted it is held in place by an equally solid, machined end cap that screws onto the base. 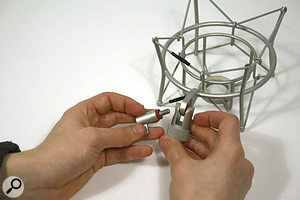 The outside of the protruding connector is threaded so that it can screw directly into the included shockmount, where an integral locking ring allows the mic to be secured pointing in any direction. The single circuit board is populated with good-quality capacitors and resistors, and the inside of the microphone follows a monocoque construction, making it rigid while allowing easy access to the components. There are no retaining clips for the tubes as there are, for example, in Rode's tube models, but as the mic made the trip from China to here without the tubes working loose, this appears not to be a problem. Cosmetically, the SE range has been redesigned with a satin nickel finish on the upper half and a tough textured grey finish on the main body. The mic model name is engraved into the brass body sleeve, and the new SE embossed logo denotes the front of the microphone. The Gemini has a 20Hz-20kHz frequency range, but with a little presence lift to add air and detail to the high end. Its sensitivity is a fairly typical 20mV/Pa, and the output impedance is an equally typical 200Ω. Its equivalent input noise level is 16dBA, which is on the good side for a tube mic, and though the mic has no pad switch fitted it can accommodate SPLs are high as 130dB (for 0.5 percent THD at 1000Hz). This isn't as high as some models I've reviewed, but is still more than adequate for most situations in which this type of microphone is likely to be used. It is certainly more than enough to deal with even the loudest vocalist. There's also no low-frequency roll-off switch on this mic, so if this facility is needed it would have to be provided by the mic preamp. 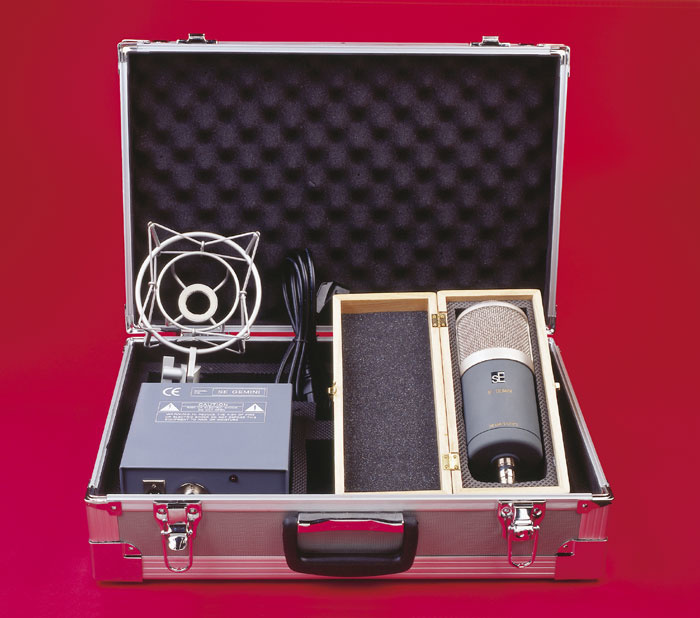 As with all tube microphones, the Gemini comes with its own external power supply, and as is invariably the case, this is an unassuming steel box with a multi-pin input for the mic cable, a balanced XLR output, and a mains switch. Power comes in via the usual IEC socket, and there's a voltage selector that switches between 220V and 110V operation. Because of the way the retaining screw is assembled on the shockmount bracket, the substantial weight of the mic tends to loosen it, causing the mic to droop. However, it is the work of only a few seconds to remove the retaining screw and reassemble it backwards, thereby remedying the problem.Photo: Mike CameronI have to admit that when I first tried the Gemini I didn't hear quite the result I was expecting. Instead of a thickened low end combined with slightly restrained highs — the typical tube-mic sound — the Gemini sounded full-on right across the audio spectrum. The high end seemed to go on forever and, interestingly, the mic appeared to be a few decibels more sensitive than the other mics I put it up against. The ability of this mic to capture high-end detail puts vocals right in your face and captures every nuance of stringed instruments, but it still doesn't sound at all harsh or over-assertive. Furthermore, if this level of transient detail is too honest for some applications, moving off axis a little way, or deliberately singing or playing over the mic rather than directly into it, gives a warmer, more forgiving tone reminiscent of those valve mics that deliberately deliver the expected 'tube' sound. Whereas some valve mics can sound constricted, albeit in an artistically pleasing way, the Gemini retains a very open character with a lot of air around the sound, and I soon grew to like this aspect of the mic's character very much. Because of this ability to reproduce transients so effectively, the Gemini also makes a nice percussion mic, but it would be wrong to try to typecast it, because it's really a very good all-round performer. In combination with its shockmount, the Gemini is reasonably resistant to low-frequency vibrations, and the large basket makes it less susceptible to popping than most, though a pop shield should still be used for close-miked vocal work. The shockmount is reassuringly solid, though I found it worked better if I removed the swivel screw and then turned the fitting around the other way before reassembly — by doing this, the weight of the mic tended to tighten the restraining screw, whereas if left as shipped the weight of the mic tried to loosen the screw. SE Electronics' Gemini is pleasantly unusual, and while it may not be the obvious choice for smoothing away rough edges, it's fantastic for placing your vocals right at the front of a mix or for delivering an intimate sound. It has warmth and it has depth, but that's balanced by its airy high end, and I'm sure the transformerless output stage has a lot to do with this. Most people buy tube mics because they want something that flatters the sound and, though it doesn't flatter in quite the same way as most other tube mics, the Gemini certainly paints a big picture, adding gloss and sparkle as well as weight. For such a big mic, it is capable of extreme delicacy, but it also sounds great with powerful vocals and can double up for just about any other studio task. If you already have a 'traditional'-sounding tube mic, the Gemini makes a useful alternative, but if you don't yet have a tube mic, you should as always evaluate it using the type of voice you're going to be recording — like any mic, it will favour some voices more than others. This isn't a cheap cardioid microphone in the UK by any standards, but it does deliver a uniquely detailed and spacious sound and it's sheer size should impress the hell out of your clients! Less constricted-sounding than many cardioid mics. The weight of this mic means you need a good stand! No low-cut or pad switches. The Gemini is a serious mic and is priced accordingly, but I was soon won over by its larger-than-life, upfront sound. 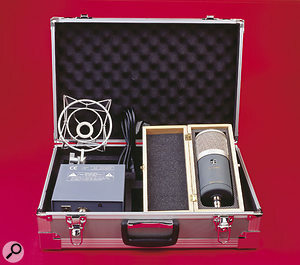 If you need a tube mic that offers something a little different from the ordinary, check this one out.